At the end of April this year, we did see how LG rolled out their latest masterpiece, which comes in the form of the LG G4 smartphone. Well, it certainly looks as though the high end smartphone market from LG has just gotten yet another entrant, where it will be known as the LG V10. The LG V10 is the latest smartphone that will boast of multimedia capabilities which have not been seen before in a mobile device, where it has been specially designed to deliver a rich multimedia experience – regardless of whether it is meant for consumption or creation, targeting the social network savvy consumers of today. In order to stand out from the rest of the crowd, some of the distinctive new features in the LG V10 will include a Second Screen, Dual Front Cameras and Manual Video Mode that will hopefully help it be different. Not only that, if you would like to turn heads each time you whip out your handset from your pocket, the LG V10 does not disappoint, since it boasts of high-grade stainless steel as well as a durable silicone skin that makes it one of the rare smartphones to pass drop tests for shock which have been conducted by an independent third party. The Second Screen is an interesting idea, as it has been presented to be an inset display located right above the main 5.7” QHD IPS Quantum Display. It will work independently, allowing you to set it up as an “always on” display to enhance the V10’s productiveness, without having to impact battery life negatively. The Second Screen can show off the weather, time, date and battery icon when the main display is off, and when the main display is called into action, the Second Screen can be set to convert to a dedicated launching area for shortcuts or your favorite apps. 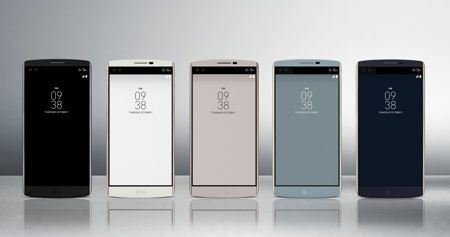 As for the key hardware specifications of the LG V10, they include being powered by the Qualcomm Snapdragon 808 processor, carry a 5.7” QHD IPS Quantum Display, has a 2.1” IPS Quantum Display for the Second Screen, 4GB of RAM, 64GB of internal memory with a microSD memory card slot for expansion purposes, a 16MP shooter at the back with F1.8 Aperture/OIS 2.0, a 5MP Dual Lens in front, a removable 3,000mAh battery, Android 5.1.1 Lollipop as the operating system of choice, and LTE support, all crammed into a chassis that tips the scales at just 192 grams. There is no word on pricing just yet, but the LG V10 will hit South Korea from this month onward, arriving in the US, China and key countries in Asia, Latin America and the Middle East shortly afterwards.